The rules require no order writing or cards. The only marker required is cotton wool or tissue paper for indicating pinned and disrupted status. They are designed for 2mm figures to be played on a 2ft board in an hour or less. The rules are solo gamer friendly. These rules differentiate themselves by two core mechanics. This is the trait of Napoleonic infantry to refuse to budge once it had started firing at an enemy. This made the commitment of units an important decision, as the general was unlikely to regain control over them again for some time. Napoleonic battles were rarely "set piece" battles. Units would arrive in clumps and make their way towards the front, often arriving from the flanks. This gives a very different feel than a battle where the units are all lined up facing each other at the start. Each unit represents a regiment or in some cases a brigade. The game can represent either part of a larger battle or a smaller battle in its entirety. Based on the army lists, the “sides” represent approximately a corps (with support). Larger, multi-corps battles should include a corps headquarters and an overall army HQ. Estimated scale is 1” = 100 yards, and time scale is estimated at about 30 minutes. Multi-corps battles should have a 2x2’ area for each “corps”. Since regiments and brigades were never of a standard size, there are three options for “sizes”: Large, common and small. This applies to infantry for firing and melee and cavalry for melee only. Large units are considered to be larger than 2000 rank and file, common sized between 800 and 1999 rank and file, and small less than 800 (for historical recreations only). The rules are designed for 2mm figures to be played on a 2ft by 2ft table (hence "2 by 2") which can be played to completion in an hour or so. There is no ground or time scale beyond it "feeling" right. All units are based on 1 inch by ½ inch bases. I double up stands on the base to try and make a more attractive appearance but single blocks would be fine. A word on unit formations. As you, the player, are playing at a higher command level, the individual unit commanders are presumed to change unit formations at THEIR discretion. (IE: an infantry unit preparing to receive a cavalry charge would presume to change to square, etc). Therefore, unit formations are not shown on the table. HQ - A HQ does not just represent a general and his staff it also represents his signals and area of interest. HQ's will often be found flitting across the battle field from flank to flank allowing units to rally as they get near. Some armies allow for more than one HQ at once in an army which is a powerful advantage. Line Infantry - The army's backbone. Cheap, reliable and likely to be the vast majority of your force. Excellent at holding strong points. However once an infantry unit starts firing, it is automatically pinned and is hard to get moving again. Guards / Grenadiers - The elite of the army, whatever they are called. Better at melee and also more able to rally. However if a Guards unit routs then ANY unit it passes within 1" of during its rout also routs, if this other unit as also a guard then the chain continues. Heavy Cavalry - Heavily armored and a terrible sight to behold. The masters of melee combat. Should not be used to charge non disrupted infantry front unless you are feeling lucky. Light Cavalry - Great for dashing across the battlefield but a weak unit. Best used to finish off a disrupted unit. Light Cavalry may during its movement phase voluntarily ROUT. This is particularly useful if pinned in a vulnerable position. However it should be noted voluntarily routing units are still destroyed on a 1 or a 2 as per the routing rule. Light Infantry - These are relatively rare full skirmishing units. Not to be confused with small packets of skirmishers which comprise many units of the period. Light Infantry treats any result due to shooting as a PINNED result. In other words a light infantry unit cannot be routed or destroyed due to shooting. In addition Light Infantry may during its movement phase voluntarily ROUT. This is particularly useful if pinned in a vulnerable position. However it should be noted voluntarily routing units are still destroyed on a 1 or a 2 as per the routing rule. Militia – Any less reliable or second rate troops. A Militia unit automatically routs if any other unit routs within 1” of it or passes by within 1” when routing. At the start of the game players may decide on a "fast" or "decisive" game. A "decisive" game can last longer but gives a slightly more agreeable result; "fast" games are usually over in less than an hour and are a very much sudden death games. "Fast" games are lost by the first player who has 5 units destroyed. "Decisive" games are lost by the first player to lose 5 units or more AND who has lost 2 more units than his opponent. Draws are possible and common in 2 by 2 Napoleonic. A player may start to play for a draw only after EITHER side has no reinforcements left (i.e. : he or his opponent has brought on table all of his units). If he then exits all of his units off his table edge then he achieves a draw. Note that units FORCED off the table by routing count as destroyed and so towards victory so this exiting strategy is difficult to pull off. 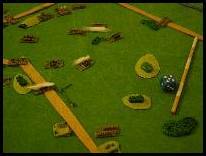 If playing for a draw players are advised to first disengage their infantry from the enemy then use artillery and cavalry to cover the retreat with cavalry being the last off the board. If the dice are tied then each player may place an extra 10AP at the start of the game. Players then re-roll, it is possible in this manner for all the AP's to be setup at the start of the battle eventually. The player with the higher score is the attacker. The player with the lower score is the defender. The defender places 10AP of units within 6" of his base edge but no closer than 3" to the side of the board. The attacker places 10AP of units within 6" of his base edge but no closer than 3" to the side of the board. The defender then picks a reinforcement point anywhere on his defending edge of the board and places the reinforcements he intends to arrive there next to it in order of appearance. The attacker then picks a reinforcement point anywhere on his edge of the board OR anywhere on either flank that is not within 6" of a defending unit or reinforcement point. He then places the reinforcements he intends to arrive there next to it in order of appearance. The defender then picks a second reinforcement point anywhere on his defending edge of the board and places the reinforcements he intends to arrive there next to it in order of appearance. The attacker then picks a second reinforcement point anywhere on his edge of the board OR anywhere on either flank that is not within 6" of a defending unit or reinforcement point. He then places the reinforcements he intends to arrive there next to it in order of appearance. The defender then takes the first move. During each movement phase any unit which is not pinned or disrupted may move up to its full movement allowance. Units may pivot/ wheel/ spin at no cost. Units may move sideways at a cost of x2 distance but units may not move to contact in this manner. Units may move directly to their rear at no additional cost. Road - If a unit spends its entire move on a road it gains +1 inch in movement. Stream - To cross a stream costs an extra inch in addition to the base distance. Hedges/ walls - No cost. Towns – All units move at ½ rate and do not receive the road bonus when moving through a town. This represents the disorder caused by navigating the streets and the need to regain order. Note cavalry may cross streams and walls etc. at above movement penalties but never receive any cover bonus for terrain. No unit other than light infantry may enter woods. If they are ever forced to by rout then they are destroyed. If during the movement phase the front part of the movers base contacts any part of an enemy base then a melee is performed. Note that for a melee to occur the last 2" of the units move OR its entire move (if less than 2") must be STRAIGHT AHEAD. If this is not possible then he may not move to contact. A melee occurs if any part of the attackers base touches an enemy units base. It is possible for units (attackers and defenders) to be engaged by more than one unit. Cavalry may not move to contact on the same turn they move through a town. After a melee occurs if the attacker was routed/ destroyed then the defender does not change facing, but the attacker is aligned in face to face contact with the defending unit and routs directly away. If the defender was routed then the defender aligned himself in front base to base contact with the attacker first and THEN routs directly away from the enemy. At any time during each movement Phase, the phasing player may dice twice for reinforcements. It costs 1" worth of movement front base fully lined up with the board’s edge to exit the board. No reinforcing unit may physically start on top of or move through another unit when it enters the board. If there is no place available within 3" of the reinforcement point it may not enter that turn. A rally removes a disrupted or pinned effect from a unit. 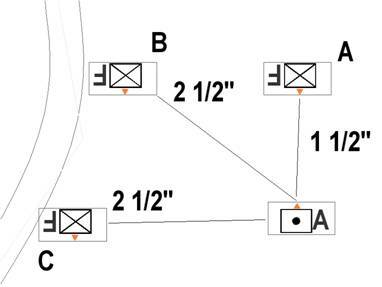 To attempt to rally a unit must be within 6" of a HQ unit in its chain of command. Note that under normal circumstances it is also impossible for a unit to rally if an enemy is within 2" of it. Exceptions being Guards units and units whom the HQ is in base to base contact. A HQ may always attempt to rally itself and gains a +2 bonus for doing so. Extra HQ's do not add additional modifiers. A full explanation of the effects of the rallying rules is given in the "Flow of Battle" section. HQ's, Heavy Cavalry and Light Cavalry may not shoot. Any Infantry unit that shoots is automatically pinned and is marked as such immediately upon firing. A unit may shoot only ONCE during its turn. This means if a unit is charged by two attackers only one can be shot at. However, if both charging units are touching or closing to contact from the same aspect, they are considered 1 unit for target purposes. When the rules ask for a range to be measured or to see if a units is within X inches of a unit then the measuring point is the center of the nearest face to any edge of the target base. Destroyed - Unit is removed from play and counted towards victory conditions. Routs – Every time a unit routs for whatever reason the owner must roll a D6. On a 1 or 2 the unit is destroyed. If not, the unit moves its maximum move either to its direct rear or directly away from the source of the shooting. After this move is completed the unit is also disrupted. If at any point during the rout the unit touched an enemy unit, the routing unit is destroyed. The routing unit may pass through friendly units, but if it ends its move on a friendly unit, that unit is moved back to make room and is marked as pinned. Disrupted - The unit is marked as disrupted (usually by placing cotton wool or another marker on the unit). Until it rallies the unit may not fire or move. In addition it is more vulnerable to attacks (see factors). Pinned - The unit is marked as pinned (usually by placing cotton wool along the front edge of the unit). Until it rallies the unit may not move but is permitted to change facing during the move phase. The unit may fire normally. This phase represents a charge or counter charge in the grand manner. Results, take the difference in scores. In the case of the loser routing or being destroyed the winner has the option of immediately moving by "follow up" up to a full move directly ahead if he wishes. If this "follow up" move contacts another enemy unit then another melee is performed. This can be repeated until no more units are contacted. If a HQ is in base to base contact with a unit (i.e. : for the purposes of rallying or combat bonuses) and that unit is destroyed then the HQ is also destroyed. 2 by 2 Napoleonic games flow in a manner which reflects my reading of the period and accounts battles. It is my conceit that a game of 2 by 2 Napoleonic's when retold will sound much like the narrative of a real battle. Certain patterns emerge in 2 by 2 games which is good to know in advance. As the rules state when an infantry units shoots its muskets it becomes PINNED. As there is likely to be an enemy unit within 2" then it becomes impossible to rally that unit unless it is Guards or in base to base contact with a HQ. Infantry of the time usually had one single good volley then every man started firing as fast as he could often blindly into the smoke ahead, once a unit started firing thus it was incredibly difficult to get it to stop. In particular if you are on the attack then you should avoid firing as your attack will stall. Like commanders of the time you should insist on your troops using the bayonet as the weapon of the offense. That said an infantry units "first volley" i.e. : before it becomes pinned can be incredibly effective especially against cavalry. You will be tempted to use your cavalry, especially heavy cavalry, as a metal fist with which to smash the enemies line. Be cautious. Cavalry is almost certain to lose against infantry whether it is pinned or not. Remember infantry can turn to face when charged so it is impossible to "catch" a unit in the flank except if you charge the unit with two attackers. This is a deliberate design decision as formed infantry could almost always form a square and become invulnerable to cavalry. This is not to underestimate the power of cavalry, a fast reserve force that can threaten breakthroughs and finish off disrupted units is an essential part of any force. In particular cavalry can pose a terrible threat to HQ units caught out in the open. Cavalry is also the king of the multiple melee turn. It IS possible for a cavalry unit to destroy multiple units in a single turn by use of follow up. As you will have noticed in the rules to rally a unit needs to be within 6" of a HQ and normally you only have 1 HQ. Even with a movement rate of 6" HQ's will need to be crossing the center of the board quite often if they are to serve both flanks. If the center cracks then entire armies can be cut in two. In addition HQ's can give special attention to critical units by getting into base to base contact with them. To lead a special charge, aid in a critical defense or help rally a stricken unit. Napoleonic battles were distinctive in how often a battle was determined by the timely arrival or delayed arrival of reinforcements often on the flanks of the enemy. 2 by 2 Napoleonic battles are rarely simple affairs where both sides line up their armies then the battle begins. The feeding in of forces is an essential part of the game. Some players will indeed choose to wait for all their forces to arrive from the rear then form a long battle line before engaging the enemy. This could well be a winning strategy, however it requires the assent of the opposing general who may have other ideas, or perhaps not, in which case a grand set piece battle will result. Users are encouraged to make up their own Army lists. Using the unit point costs listed above. In addition we have provided a Standard Template below. The Army lists represent a “Command” each army list or “command” can only have 40AP. For players who wish for larger point games then I recommend using multiple Commands across multiple boards, if there is enough interest then a set of “Big Battle” rules can follow, similar to the wonderful DBA rules by Phil Barker and WRG. Notion used. Each command can take up to the indicated amount of units. A minimum number other than zero means that unit must be purchased (usually HQ’s). EG: 1-3 HQ means that at least 1 HQ MUST be purchased. A number in brackets indicates IF that unit type is purchased then that is the minimum amount. EG: (2)-6 Line Infantry means that if you choose to buy Line Infantry then you must by at least 2 and a maximum of 6. French artillery unit A can shoot at one of Austrian infantry units 1,2 and 3. 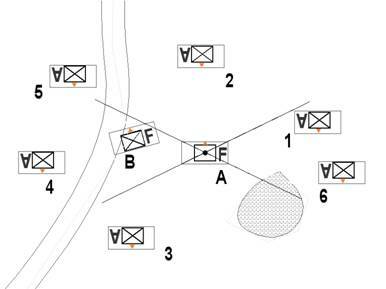 Only unit 2 is to its front and so units 2 & 3 use the “shooting out of flanks or rear” -2 modifier. Units 4& 5 cannot be shot at because friendly unit B blocks the line of sight which is taken from the two widest points of the shooters base relative to the two furthest points of the targets base. The Austrian Artillery unit measures distance to his possible targets. Note he uses his front center edge to unit B because he is shooting out of his front at that unit. He uses his side center point as he is shooting out of his flank at unit C.